Planocarpa nitida is a small erect shrub with spreading, sharply pointed leaves. 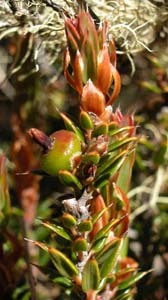 It is only known from the Central Plateau, especially near Lake Augusta. It is very similar to the other species of Planocarpa, but differs in having pungent leaf apices.